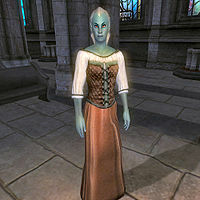 Uravasa Othrelas, a Dunmer, is a Layman of the Nine Divines and the resident priest at the Great Chapel of Mara in Bravil. She offers basic Speechcraft training and sells a variety of spells, mainly from the magic school of Restoration. Like the other residents of the chapel, Uravasa sleeps in the chapel hall every night between midnight and 6am. After waking up, she spends the first two hours of the day strolling around the downstairs area: the undercroft, the chapel hall or the stairs leading to the main chapel. At 8am, she finally heads up into the main chapel and spends the rest of the morning there. At midday, she returns to her routine downstairs and will keep going until 4pm. At that time, she positions herself in front of the Altar of the Nine and prays for two hours. Between 6pm and her bedtime at midnight, she will wander the lower floors once again, only interrupted at 8pm by a two-hour dinner, which she will take at the big dinner table in the chapel hall. She will offer her services at all times except when eating or sleeping. At the completion of the Knights of the Nine quest Nature's Fury, the Bravil chapel is attacked by Aurorans and its inhabitants slaughtered, including Uravasa. She wears pigskin shoes, a quilted doublet, and a pair of linens. She carries around her chapel key and a small amount of gold. Uravasa doesn't wield any weapons, relying instead on a turn undead spell and a series of low-medium level Restoration spells, ranging from restore health, fatigue, and speed, to fortify speed, to cure poison. These are also the same spells that you can buy from her for a cheap price, since her Mercantile is a mere 6. Her skills with the spoken word have impressed many of Bravil's townsfolk. When asked about rumors they will say: "It's always a pleasure to hear Uravasa Othrelas speak at chapel. She has a real way with words." and "Uravasa Othrelas has a way with words. I wish she could teach me how to speak that well." Others will reply: "She really is a gifted orator. I wish she'd teach me how to do that. ", "Uravasa is an excellent speaker. Her sermons are always quite enlightening. ", "She is very well-spoken. I understand she teaches those skills as well." and "She certainly has a talent for speaking. Plus, she's willing to teach others this skill." When you first approach her, she will introduce herself by saying: "I'm Uravasa Othrelas, priest of Mara. I'm also a Speechcraft trainer. I can help you make... different mistakes, at least." When asked about Bravil, she will respond: "Mara guides and protects Bravil, like she protects any good family. Like any good family, we have our problems." When Uravasa is killed, only Alga will be available to provide basic Speechcraft training. Once the Knights of the Nine questline is completed, Uravasa is replaced by Eris Senim who, other than being male instead of female, is basically identical to Uravasa. Uravasa's family tomb appeared in Morrowind. * Indicates spells with effects which cannot be purchased anywhere else. Esta página foi modificada pela última vez à(s) 05h51min de 20 de outubro de 2015.